Swingman Nikes are part of the new Hall of Famer's story. As Ken Griffey Jr. prepares to join the ranks of baseball's immortals, his story can't be told without mentioning him as one of the game's all-time great pitchmen. Griffey's most famous endorsement has been his partnership with Nike, which includes a line of "Swingman" sneakers and cleats that are still popular today. Throughout the 90s and 00s, Griffey broke record after record in style, showing off that beautiful swing in his signature footwear. So, it's only fitting that a pair of the Kid's Nikes are part of his Hall of Fame display. Before tomorrow's official enshrinement, fans can stop by the Cooperstown facility, where a collection of Griffey memorabilia is on display. 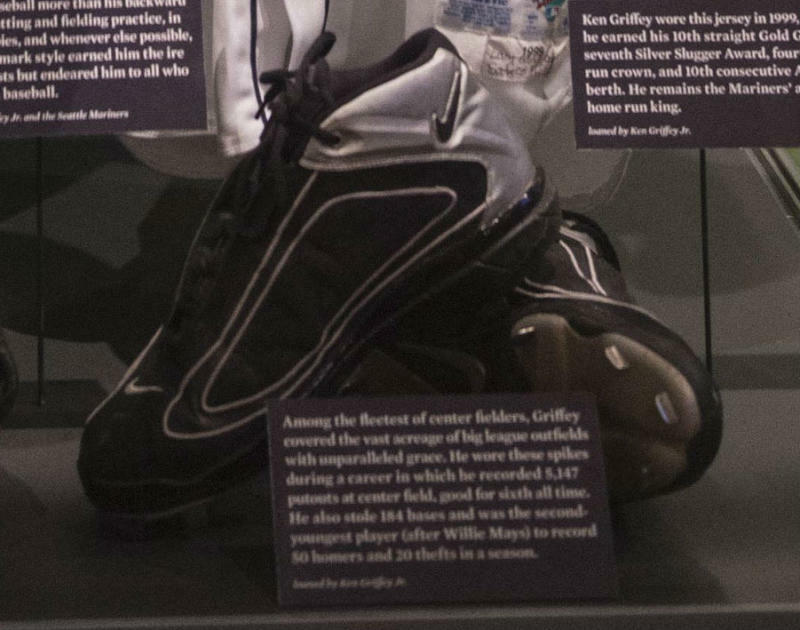 At the front, Griffey's black and silver Nike Air Griffey Max GD II cleats from the 2001 season. The story plate in front the cleats details Griffey's speed, defensive prowess and knack for stealing bases. Griffey will be inducted tomorrow at 1:30 p.m. EST.